Never before had Sue looked in the box that her husband kept under their bed. The box had been there for the past 20 years of their marriage but she had never invaded his privacy. One day, while cleaning, she decided to take a look in the box. She didn't figure it was anything he was hiding since she could have looked at it any other time but hadn't. In the box she found 3 eggs and 10 thousand dollars. This seemed very strange so she went to Fred and asked, "Why are there 3 eggs in a box under our bed?" 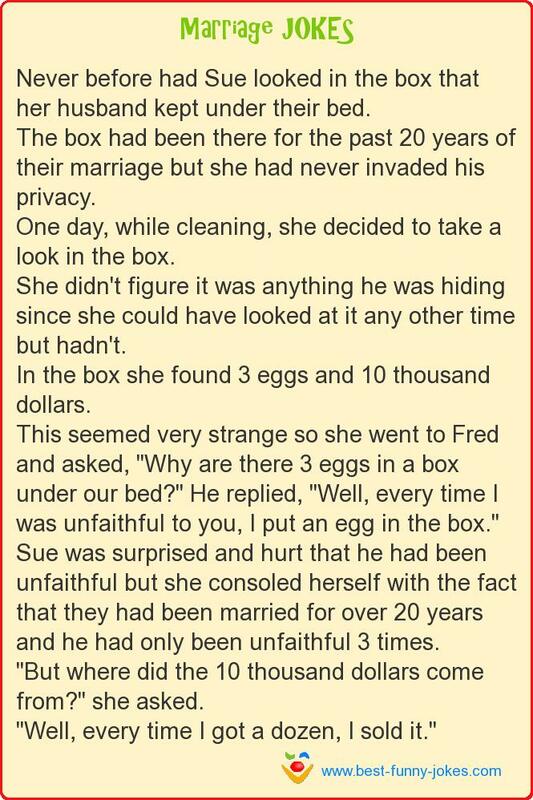 He replied, "Well, every time I was unfaithful to you, I put an egg in the box." Sue was surprised and hurt that he had been unfaithful but she consoled herself with the fact that they had been married for over 20 years and he had only been unfaithful 3 times. "But where did the 10 thousand dollars come from?" she asked. "Well, every time I got a dozen, I sold it."